Book published September 2015 by CityScapes Books. View article as published here. 101,800 sq. 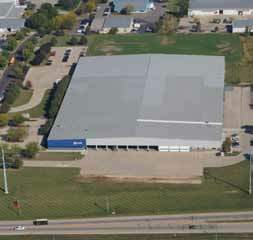 ft . high-bay distribution center in DeForest, Wis. When it comes to the future of Madison, few companies are as committed or deeply rooted as Welton Enterprises, Inc.
As a local developer of commercial real estate for nearly 30 years, Welton is the go-to company for solving virtually any type of corporate or industrial space need. It is a company focused on personal relationships, integrity, loyalty, and environmentally conscious development. Founded in 1987, Welton Enterprises is best known for the build-to-suit and leasing of industrial, warehouse, and Class A office properties in the greater Madison area. Throughout the 1990s and 2000s, the company steadily grew its portfolio, developing major properties such as the High Point Towne Venture and the West and East Metro Business Parks. Today, Welton’s local Dane County holdings include more than 25 operating properties, comprising over 1.3 million square feet of space, and more than 150 acres of prime development land. Welton is also diversifying into vibrant mixed-use developments. Plans are underway for several new, contemporary communities with a mixture of retail, office, hotel, clinic and apartments. With its substantial portfolio, Welton is well positioned to give local or out-of state businesses a host of options for space in existing facilities. Welton also offers build-to-suit development for those seeking new construction, whether a manufacturing plant, distribution facility, or corporate headquarters. Its experienced development team can assist with site selection, development consulting, due diligence, turnkey development, and design-build management as well as offer design, construction, financing, and asset management services. It is fair to estimate that more than a third of Madison’s largest companies have, at some point, occupied facilities that were developed, built, owned, or managed by Welton. These customers run the gamut, from medical device makers to agricultural seed companies. 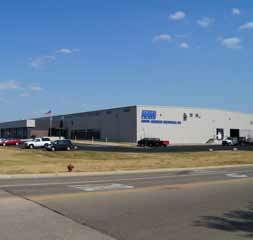 LEED-certified office and manufacturing building along Highway 19 in Burke, Wis.
220,000 sq. ft . distribution center along Highway 14/University Ave. in Middleton , Wis. But Madison companies of all sizes count on Welton. The companies in Welton’s portfolio range in size from small entrepreneurial companies to large international corporations. A diverse clientele, a full range of services, and a strong portfolio only tell part of the Welton story. Founders Ken and Kurt Welton set the tone early on for unparalleled customer service and integrity. They earned a reputation for treating every person fairly and with the same respect, regardless of resources or size of project. Their emphasis on long-term value versus short-term profits has led to a strong and loyal customer base. It is this foundation of service that Ken’s son and current president Kurtis Welton takes to heart. And he has brought those standards to the next level by assembling a team of experts who are nimble and able to quickly respond to customers’ needs. If Welton does not have the right property for a client, its staff will find, build, finance, or lease back a property. In some cases, Welton enters into a partnership or joint venture if it will create the optimal solution for the client. As a local company, Welton is deeply committed to Madison’s economic success — but not at any cost. The company is a strong advocate of environmentally responsible and sustainable development and could be considered a local pioneer in this area. Many of its practices predate local government regulations and standard green practices now used by other developers in the area. With the trademark “Beyond Green™” Welton goes beyond what is required, investing significant amounts of time, money, and other resources to make each project self-sustaining. On one property, Welton created 16 rain gardens, more than a half mile of infiltration trenches, and five ponds, which was well over the norm for preventing runoff into adjacent lands and eventually into local lakes. require that 100 percent of storm water be returned to the aquifer, regardless of future renovations to structures or landscaping. From Welton’s perspective, making a positive contribution to Madison’s future also means supporting community organizations such as the Second Harvest Food Bank or the Clean Lakes Alliance. Many of Welton’s monetary or in-kind donations are to organizations whose missions are related to space needs, such as Porchlight, which provides transitional and emergency housing. Welton also provides much needed warehouse space free of charge to organizations such as the Red Cross for flood-relief supplies and Habitat for Humanity for construction materials. Welton is building something beyond bricks and mortar. It is creating a legacy of integrity and responsiveness, both to its customers and to Madison’s longterm needs. That is Welton’s unwavering commitment. Great new, mixed-use development featuring high-end apartments and office space with outstanding views of Lake Mendota . Welton Has a New Website!